Going into last year it seemed like the Detroit Pistons had something going on. Don't get me wrong - they weren't a threat to win the division or even a playoff series in all likelihood. But they seemed to be moving in the right direction. They were at least a little loveable. On that basis, then, last year was a massive disappointment. The team was a long way from great. They won 37 games and finished 10th in the East, and they just weren't relevant in any way at all. In a generally underwhelming year for the Eastern Conference they were among the more disappointing squads. They didn't make major changes in the offseason, but neither did a lot of the Eastern also-rans. This team should be better than they were last year. Do they have what it takes to make the playoffs? Andre Drummond is a max contract player who played like about 10 percent of one last year. He just wasn't good. In fact, he was pretty underwhelming. His rebound numbers were solid-ish on the surface, but he couldn't score like he should, his general defensive play was limp, and he averaged less than 30 minutes per game. It was ugly, and a big part of the reason the team struggled. It would be easy to look at a player with a similar season and assume he was on the decline, but the big man is only 24. He reportedly was having some trouble breathing at full gallop, and he hopes that minor surgery on a deviated septum in the offseason will give him more fuel. If Drummond has a significantly better year then the team will improve, so your view of this team has to be shaped by your optimism surrounding him. Reggie Jackson is another key player who was not all he needs to be last year. Jackson missed the first quarter of the season last year and then never really seemed to fit in and make his selfish-for-a-point-guard style work as a positive for the team. It was as if the team had to find a style without him, and then they neither adapted to him nor he to them. 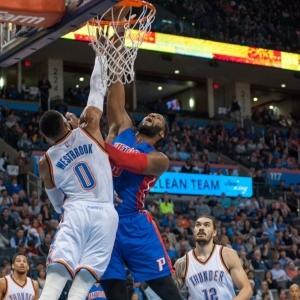 This year he is talking the right talk about being more of a team player and driving things more through Drummond. If he can do that it will be a very good thing, but that "if" is bigger than the state of Michigan. Avery Bradley is a very interesting addition to the team. Kentavious Caldwell-Pope overvalued his worth to the team and is now trying to prove himself worthy of a huge deal with a one-year contract with the Lakers. The Pistons traded Marcus Morris for Bradley to fill the gap at shooting guard. It feels like a very good move. Bradley is excellent defensively, and he is a strong leader. Of all the changes Boston made, this is the absence that it feels like they will miss most, and he is a big addition to this team. He knows a lot more about winning than the core of this team does, and he should be a positive ego check on Drummond and Jackson. Bradley is also a pretty strong shooter, which will help a team that was just plain inept from beyond the arc last year. The pressure on this team will grow rapidly if they struggle early. Things can't continue on as they are if they aren't working, so rumors of trades and coaching changes will be in serious supply if they aren't achieving at least some mediocre goals. They don't need to be beating the Cavs or anything, but having something that looks like an offense, a center that isn't an expensive shell of himself, and some more cohesion and less ego-filled drama would all help. The trade for Bradley and the departure of Caldwell-Pope are the most significant moves of the offseason. Aron Baynes left for Boston in an underrated move because he was defensively solid. Langston Galloway joined from Sacramento to back up Bradley in a low-risk deal. Luke Kennard, taken 12th overall out of Duke, is the only player added through the draft. There is likely no hurry to rush him along. There were small profits to be had in betting against the team over the course of the season - they went 38-44 ATS. The profits were on the under, too - the record on the totals was 36-45-1. I liked the team last year a bit and felt let down. I still like them to be a playoff team this year, though. The addition of Bradley is a net positive, Drummond should be better, and I hope that Jackson is both healthier and less selfish. I like the coaching as well. I expect them to be a playoff team and see mild value in the over on the season win total. Get your $60 worth of member's picks absolutely free - no obligation, no sales people - you don't even have to enter credit card information. You can use this $60 credit any way you please on any of our top NBA handicappers. Get free picks now. Also, for a limited time only get three top NBA handicappers for the price of one! Click Here . Get free NBA basketball picks today at Doc's Sports basketball predictions page .